Double movement. 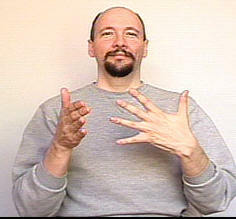 Dominant flat hand taps the ring finger of non-dominant five hand. The non-dominant hand doesn't move in this sign. Just the dominant hand. Sample sentence: Are you a freshman or sophomore? I've seen the sign FOX used as a version of the sign for "freshman." I don't recommend you use "FOX" for freshman, but I thought I'd mention it just in case you see it. I was wondering if you could tell me the possible definitions for a sign I will describe to you? The version of Freshman / Freshmen to which you are referring doesn't brush "forward" off the nose, it brushes sideways across the nose twice. I do not like that sign being used for Freshman but indeed it is a variation that shows up in Texas (and elsewhere). You will also see in Texas the more widespread (nation-wide) version that taps the tip of the non-dominant ringer finger twice with the dominant palm. One of the reasons I don't like using the "R"-hand brushing the nose is because it conflicts with an initialized version of the sign for RAT and/or MOUSE which is done with the same movement using the index finger. If I have to use the both "rat" and "mouse" in the same sentence I will sign RAT using the index finger and MOUSE using the pinkie. 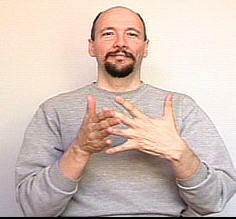 Many ASL teachers will encourage you away from using initialized versions of signs but the fact is such signs are "out there" so what I try to do is show both signs and then indicate that my preferred sign is generally the non-initialized version as long as the meaning is made clear via context. For what it is worth, I also recall seeing the sign for FOX being used to mean "freshman." (Again, I would encourage you to stick with the standard nation-wide general version of "freshman" that taps the ring finger of the non-dominant hand with the dominant palm). Is that the only meaning for that sign or a similar sign? The Deaf person signed something that looked like "RAT" then Texas. It doesn't make sense to me that he was saying "Freshman Texas!" He did this a couple of times. 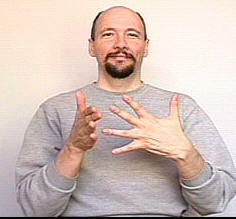 I use the National sign for "freshman" but when I interpret I try to use the signs my clients prefer. A Deaf friend of mine from Wisconsin signed "DUCK" for freshman, have you seen that version before? Maybe your Deaf client was trying to tell you that "In Texas they use the sign 'RAT' to mean 'freshman'?" Okay, if the "R" hand moves forward from the mouth area it might be an "initialized" version of the sign TRUE which would then be interpreted as REAL. Or if he had his eyebrows up it might have been "REALLY?" Hmmm, DUCK for "Freshman" eh? I'll have to remember that for the next time I run into any Deaf "Sconnies" (Wisconsinites). I personally haven't met anyone in the five states I've lived in that use DUCK for Freshman, but hey the sign DUCK shows up in some of the weirdest places. I once met a fellow (d/Deaf) who signs "DUCK MAGAZINE" to refer to a "girly magazine" -- if you get my drift. If I run into him again I'll have to ask him why he signs it that way and/or where he picked that up.